Scoliosis is a bending and twisting of the spinal column affecting mainly the thoracic (middle spine) or the lumbar (lower spine) it is sometimes progressive and distorts the chest and back. If left untreated, can lead to severe deformity. The spine has an important role. The spine supports our erect posture, stabilizes our limbs relative to our trunks, supports our abdominal and thoracic regions, and protects our neural elements. The spine is in balance when the head is aligned with the pelvis. Scoliosis is a condition in which the spine is curved in the coronal or frontal plane. The coronal plane is the view from the crown (corona) of the head down. The frontal plane is the view of the body from the front. Scoliosis encompasses curves of 10 degrees and greater. Besides physical deformity, it can lead to malfunctioning of organs that get misplaced and misaligned, causing problems of the respiratory, digestive, endocrine and other body systems. In rare, severe cases, scoliosis can lead to premature death. straight spine is essential for good health.-It ensures that all the organs of the body are in their rightful places and that nerve signals are transmitted smoothly from the brain via the spinal cord to the rest of the body. First, the spine does not develop its normal front to back arches, and this causes unusual weight to be carried on the spinal discs. Second, the center of certain discs shifts to one side, and the vertebra tip to the other side, just like a teeter totter. This misalignment, called a subluxation, causes the spine to tip to one side. To compensate for this bend, the spine then tips to the other side at another level and the result is scoliosis. Abnormalities in the vertebra at birth. Uneven stress or muscle tension, whereby the muscles on some parts of the body are perpetually more tense / tighter than other parts. Extreme dietary imbalances and nutritional deficiency. Neuromuscular disorders, such as cerebral palsy, myelomeningocele, or paraplegia. Connective tissue abnormalities, such as osteogenesis imperfecta, Marfan's syndrome, or Ehlers - Danlos syndrome. Other injuries to the developing spine. Often, family or friends first detect scoliosis in an adolescent by noticing an asymmetry in the shoulders, rib cage, waist, or pelvis. Screening is useful if early identification permits treatment that may halt the progression of the deformity. A Simple test to recognize Scoliosis is by bending over from the waist while keeping the legs and arms straight and the palms together. From the rear, a clear rib bulge (as in the picture) will be visible if one has scoliosis. A common sign of the problem is one shoulder blade being more prominent than the other, with the tendency to lean a little to one side. The hips may be uneven. Nearly all patients with adult scoliosis will respond to conservative treatment and lead a normal, functional life. When pain is present, it is usually short term and manageable. Treatment for adult scoliosis should almost always begin with a non-invasive approach. Non-steroid Anti-inflammatory Drugs (NSAID) have been the cornerstone of medical therapy for arthritic and inflammatory conditions. These medications can quiet the pain and stiffness caused by degenerating discs and joints. Physical Therapy is an excellent way to improve function, flexibility, endurance, and decrease pain. Usually the therapist will work with patients toward becoming less symptomatic, and maintaining the improvement with an active home exercise program. Working out in a supervised environment with the help of a physical therapist is the best way to achieve it. On average, therapy lasts 2 - 3 times per week for 4 - 8 weeks. It is very important that adult patients with scoliosis get into the habit of doing a daily exercise routine. This will improve the strength of the trunk muscles and take some of the stress off from the spine. Often when pain occurs, it is because the patient is not doing his or her exercises. Back brace is helpful in getting some relief from back pain in patients with degenerative scoliosis. In 1983, Dr. Copes invented the Copes Scoliosis Dynamic Brace. For more than 20 years he has specialized in treatment and research of scoliosis. Each Copes brace is designed to obtain at least 20 degrees of correction. When used in conjunction with the Scoliosis Treatment and Recovery System (STRS) there can often times be up to a 50% or more correction over a period of 18 - 36 months. Time depends on the range of curvature and compliance with the program. A word of caution is in order however: the brace should not be used without faithful compliance with an active exercise program. Brace wear without exercise tends to lead to a weaker spine that becomes dependent on the brace. Daily exercises and occasional (when needed) brace wear lead to the best results, where bracing is concerned. Surgery to correct adult scoliosis is the most challenging surgery done in orthopedics, and is likely among the most complex and demanding surgeries of any kind being performed today. This type of surgery requires at least one assisting surgeon and often a surgical team, and can take from 4 - 14 hours to accomplish. Anterior Surgery - If the spine must be fused anterior or from the front, a thoracic or general surgeon will be a part of the surgical team to safely mobilize the great blood vessels off the spine where the spine surgeon will work. The incision may be through the side of the chest, through the side of the abdomen, or through the front of the abdomen, depending on what is needed at the time of surgery. The purpose of anterior surgery is to remove the discs, and fill the space with bone graft. This serves to improve the correction which can be achieved and improve the reliability of the fusion. Sometimes the spine is "instrumented" from the front, meaning that screws are placed into the vertebra and attached to a rod that will correct the deformity and stabilize the spine. More recently, the thoracoscope has been used in spine surgery. We can now remove discs from the thoracic spine and insert bone graft without making a large incision. All of the work is done through a few one-inch incisions on the side of the chest. 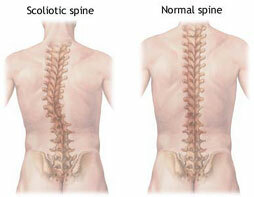 Posterior Surgery - Most of the correction of scoliosis is done from the back of the spine. If nerves are compressed by bone spurs or a disc herniation, the offending structures can be removed to allow more room for the nerves. The spine is then "instrumented" by the placement of hooks or screws that attach to the vertebrae. These hooks and screws are then attached to rods that span the curve. The instrumentation is then distracted, compressed, or rotated in order to correct the spinal curvature. Without instrumentation, the curve cannot be corrected. Bone graft is always used in scoliosis surgery. The spine must be fused in its new corrected and straightened position. The graft most commonly comes from the patient's own pelvis. Sometimes bone-bank bone is used when there is not sufficient bone available form the patient. As the bone graft heals over the next several months, the spine becomes solid and will not curve again. But the part of the spine that has not been fused will still be flexible, and allow nearly normal overall movement. According to medical science, there is "no cure" for scoliosis. The only medical treatment available is surgery to insert a metal rod into the spine, to force it straight. This is not an ideal solution, however, as it does not allow free movement of the individual vertebrae. One must be aware that scoliosis curves can neither be improved nor their progression prevented by exercises. However exercises for spine stabilization are beneficial for most people with spine problems. After careful evaluation by a spine specialist most patients with scoliosis are encouraged to participate in athletics without reservation (swimming and bicycling are probably better than running). It is mostly recommended to engage in aerobic exercises with limited amount of resistance (no more than 40 lbs.). Gym exercises can be pursued with upper extremity work outs in sitting and supine positions, using free weights or machines (nautilus or cybex) to indirectly strengthen the supportive musculature of the back. Lower extremities exercises should avoid excessive work in deep knee or hip flexion. Keeping in shape, maintaining normal weight, eating a balanced diet and avoiding smoking are all part of a healthy back regimen. Primary attention must be focused on the DNA/cellular defecits of muscles, ligaments, and bones. Additional emphasis must include neurological and proprioceptive changes of the central nervous system, digestive system and endocrine system. Finally, boney deformities of the spine, ribs and pelvis can be properly addressed. Correction for leg length discrepancy and flat feet through the use of orthotics. Osteopaths can also advise on exercise therapy - such as mobilisation-based exercises - that can help reverse scoliosis. Exercises that emphasize good posture, such as yoga, can be helpful as well.